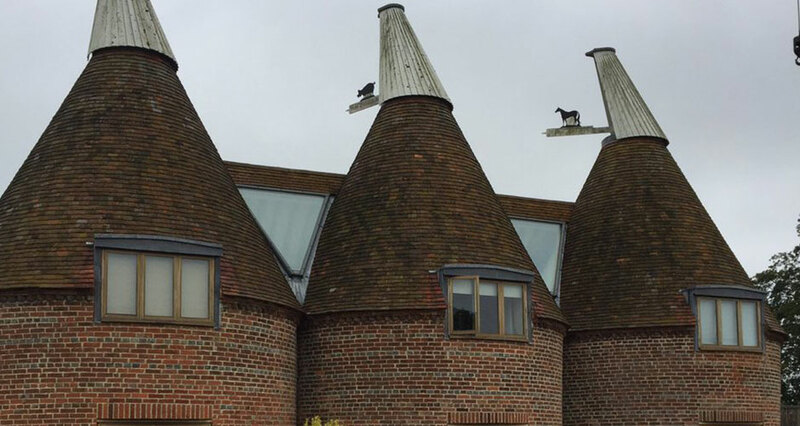 We have owned a triple oast since 1979 and had maintenance on the white Cowls worked on by several different companies. After having Dude and Arnette renovate the cowls during a complete renovation of the roundels and make new fingers for them from polycarbonate, they have looked good for several years. Darren Hole contacted me recently to remind me that it was time for maintenance and re-painting. The Dude and Arnette crew came with a small mobile crane took great care not to damage the garden, while removing the cowls and had them re-painted and ready to replace exactly when agreed. Their service, fees, quality of paintwork and timeframe was top class and we are very happy. I highly recommend Darren Hole and Dude and Arnette for any Oast maintenance, repair and painting.